Rick Warren was born in born in San Jose, California. He is a Christian Pastor and author. In Lake Forest, California he founded Saddleback Church. His book, The Purpose Driven Life. has sold millions worldwide. His teachings are Biblically based and his focus is teaching others about the love of God and finding your purpose for which God created you. His has been an inspiration to many. When you share your experiences with other people, you help take away their fears. When you become a believer, your past is forgiven, you have a reason for living, and you have a home in Heaven. Biblical convictions are essential for spiritual growth and maturity. What is ironic today is that people often have strong convictions about weak issues (football, fashion, etc.) while having weak convictions about major issues (what is right and what is wrong). 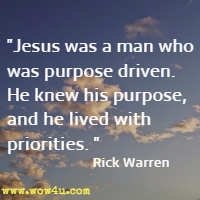 Jesus was a man who was purpose driven. He knew his purpose, and he lived with priorities. Jesus modeled a very simple life. You don't see him collecting things. He spent his time and energy on relationships - because he knew they were more important than all the stuff in the world. Doing acts of mercy gets me out of myself. It gets my focus off of me and onto other people. God's will is not automatic. He allows us to make choices. Many of the things that happen to you are not God's perfect will. We all have to choose between God's will and our will. We often choose our will. Love doesn't just happen to you. 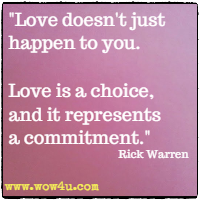 Love is a choice, and it represents a commitment. The Bible also tells one story with consistency. It was written over a 1,500-year time span, on three continents, and by 40 authors people from every walk of life, like kings, shepherds, fishermen, and tax collectors. Yet the Bible tells one story from beginning to end: God’s love and salvation for man and how he came into this world through Jesus Christ. It’s an amazing example of the power of God to write that story for our lives. Real love doesn't just love someone who's lovable. That's easy. Real love loves the unlovable. Real love is patient with the irritable people in your life. Our world needs people who can explain effectively to others what they believe, because most of the people in the world don’t have a clue what they really believe, much less why they believe it. 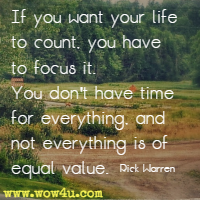 If you want your life to count, you have to focus it. You don't have time for everything, and not everything is of equal value. Standing courageously for an unpopular opinion isn’t easy, but the rewards of standing courageously for the truth will last forever. You can go 40 days without food and three days without water. You can go eight minutes without air. But you can't go a single second without hope. It's an essential part of life. Forgiveness is instant and unearned, but trust must be earned. Get honest with God, and your focus will shift from just seeing your problems - no matter how overwhelming they seem - to the grace of God. When you start thinking about something positive instead of something negative, something good instead of something evil, the old will lose its appeal and won't have its allure anymore. God can handle your doubt, anger, fear, grief, confusion, and questions. You can bring everything to him in prayer. You don't have to be thankful for a bad situation, but you can be thankful in a bad situation. Frustration may be a blessing in disguise. 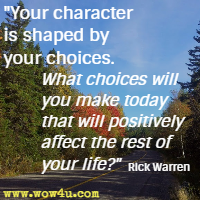 Your character is shaped by your choices. What choices will you make today that will positively affect the rest of your life? Your self is created by your memories, and your memories are created by your mental habits. God doesn't intend for you to handle all the pain and stress in your life by yourself. We were wired for each other. We need each other. You will never be able to make a change in your life or fulfill God's purpose for your life until you understand that you are wonderfully complex and uniquely designed for God's glory. 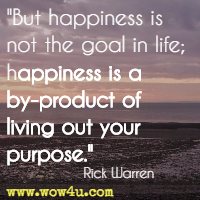 But happiness is not the goal in life; happiness is a by-product of living out your purpose. Friendships are often tested by separation and silence; you are divided by physical distance or you are unable to talk. In your friendship with God, you won't always feel close to him. The blame game is a waste of time. Any time you're busy fixing blame, you're wasting energy and not fixing the problem. When you think about those people who try your patience, stop and remember how patient God has been with you. You see pain with your eyes, but you sympathize with your ears. Sometimes the greatest way to serve someone is just by listening. Behind every need is a story. Real, meaningful success isn't based on what we have, our appearance, or in "feeling good". Real success comes from living our lives by God's values - and the ultimate reward of enjoying eternity in Heaven. If you want confidence, then understand how much you matter to God. If God loves you, who cares what anybody else thinks?